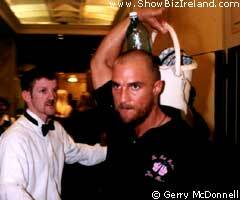 ShowBizIreland.com joins Hollywood star Matthew McConaughey ringside as he starts his new career as an assistant boxing trainer in Ireland. The actor who can currently be seen in cinemas along with Jennifer Lopez in The Wedding Planner has moved to Ireland for six months to film Disney's most expensive film to date Reign of Fire. On Friday night both McConaughey and his Reign of Fire co-star Christian Bale arrived at his first working pro fight with his trainer, Ireland's Pat Henry (also Micheal Flatley's trainer) and a group of friends from the film. 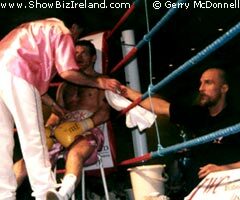 Then as the guests got seated Matthew went backstage and changed into his training gear to act as assistant trainer to the Irish boxer Jim Rock even wearing one of Jim's Pink Panther T-shirts. 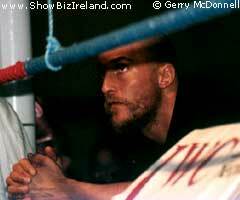 McConaughey then watched and helped Rock win his 20th victory in 21 pro fights. Rock beat the Englishman Jason Collins in record time. The actor attended the fight alone and told friends he was still dating actress Sandra Bullock. As our WORLD EXCLUSIVE pictures show this is no hobby for the Hollywood star who has been training with Jim Rock for the past few months in Ireland.